If you go to Marketwatch.com right now you may still see a Wachovia ad that I thought was pretty ironic given the recent events in the financial markets. As you probably already know, Wachovia just sold its banking division to Citigroup once word came out that the government bailout was rejected. Apparently it had been counting on that passing for it to have any chance of surviving. So chalk up another bank that has fallen by the wayside. So what is the irony? 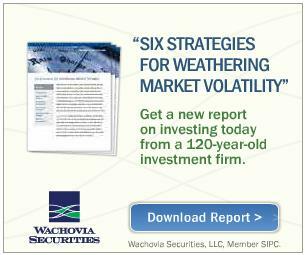 The irony is that in the ad Wachovia Securities wants to sell you investment advice with “Six Strategies For Weathering Market Volatility”. Really? Your entire banking division just collapsed and you’re claiming to have sound investment advice for me? Please explain that. Or did you just not happen to send your banking division a copy of this report? You could have even used inter-company mail and saved on the postage fees. Now there is some sound advice and I’m giving it for free. I love that I come all the way to India to blog about our financial markets.